Banana bread is a staple in our home and we have done an incredible amount of experimenting to create fantastic free-from versions – this is our gorgeous gluten-free banana bread. It is also free-from eggs, dairy, soya & nuts and all other allergens. It’s chockablock full of bananas, spices and all things jolly nice for you bod! Aars has always enjoyed making banana bread as he gets to mash up the bananas, and then mash in the spices and basically mash and bash all the ingredients together. Our banana bread recipes are really simple and child-friendly. Until a couple of years ago they were all made with normal flour. When I had to cut gluten out of my diet I started to mess around with the flours – my first disaster was using tapioca flour which resulted in a brick of banana jelly! YUK! Two years down the line I am a load more experienced and have a better understanding of the different gluten-free flours and what will work for different needs. 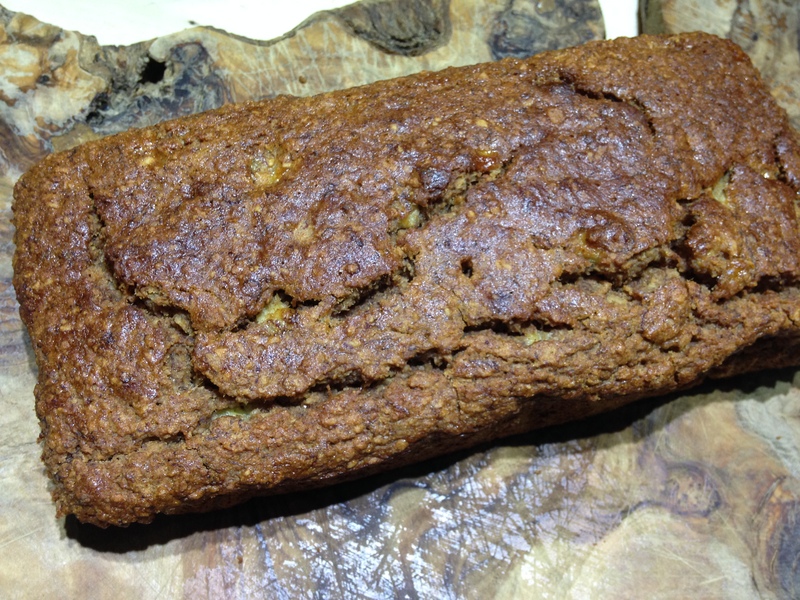 We make a lot of our cakes and muffins with gluten-free oats, and this gorgeous gluten-free banana bread has a mix of said oats and brown rice flour. I created it during half-term and it was a hit – gobbled down at record speed. We scoffed a loaf and a half when it came out of the oven!! (Yes we are a greedy home – when it comes to gorgeous grub). This morning I discovered that it was “National Banana Bread Day” in the USA so had to share it with you! My next adaptation to the gorgeous gluten-free banana bread will be making it refined-sugar-free too. Then it will be the ultimate health food which tastes really scrummy (I hope & plan) whilst being really great for us. Win Win! Preheat your oven to 190º C (fan) & place the bread cases in their tins. In a large bowl combine all the ingredients in the order provided above. Once mixed (doesn’t need to be smooth, lumpy is good) pour the mix into the waiting cases. Pop into the oven for about 30 minutes (use a skewer to check the loaf in the middle – when it is cooked through the skewer will come out clean). Leave them in their tins for about 5 mins after getting out of the oven before placing on cooling racks. We love eating this bread warm from the oven with a little spread melting on top! These are great fun to make with your children - they will love mashing up the bananas, and mixing everything together.